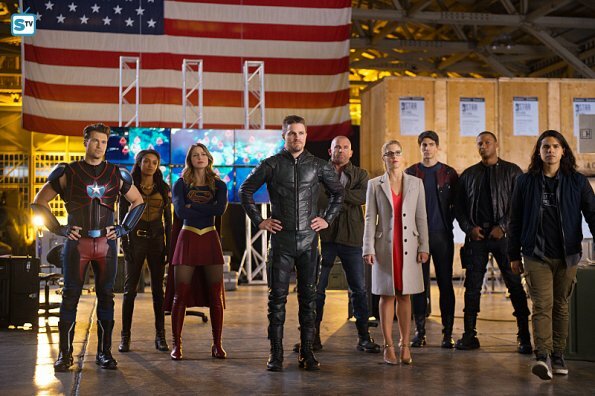 The Legends team up with Barry, Oliver, and Kara to defeat the Dominators once and for all. Meanwhile, Stein comes to terms with the time aberration he created back in 1987: his daughter. These two together will always be my favorite. I loved their reaction to the Waverider. It was hilarious, especially Felicity's "linguistic disorientation" due to time travel. It was also perfect that they had to swoop in to save the day, or as Mick puts it, "Great. Saved by geeks." All their nerdy references were pure gold as well. Nate isn't my favorite character and Cisco has kind of irritated me lately, but their team-up was so adorably cute. I love that Nate doesn't hesitate to "vibe" with Cisco, and it was great that they were both so worried about destroying the world. And finally! Cisco finally has an epiphany about Barry's choices with Flashpoint. It didn't make complete sense, but I'm glad Cisco is over his grumpiness. Obviously, the time travel was a highlight of the episode, though their plan wasn't what I was expecting. I thought they were going to all travel back in time to stop the Dominators in the 50s. Instead, they wanted to capture a Dominator and get themselves in trouble, apparently. I liked how it connected to present day with the grumpy old man. That was a nice touch. The special effects in this episode--well, in all the episodes--were awesome. Great job, production team! The showdown against the Dominators was awesome. There were a lot of exciting moments that had me cheering and laughing. The whole thing was just epic. Barry and Kara using their super speed to save the day was fun. Firestorm is finally useful by transmuting the meta-bomb into water. That's a lot of water! Kara saves Oliver and proves aliens aren't a threat. They all work together to get it done. It was touching. I'm not crying, you're crying. Mick and Sara googly-eyed over Kara and the president was the best. Superheroes and vigilantes are finally recognized for all their work by the government. Ray and Felicity's comments about Kara were spot on. The group hug between the reluctant Oliver, Barry, and Kara was perfect. Barry and Oliver's bromance is what I live for. I don't know his name, but he was a big meanie and should go farther away than Antarctica. (Though Kara's speech to him was fantastic.) Also his younger self was a weird version of Clark Kent. Whyyyy? I hate that Flashpoint is the reason the Dominators arrive to destroy the metas. How did the Dominators even know about Flashpoint? Why is everything Barry's fault? Why does everybody assume metas are evil? There are plenty of good metas out there. It was just... annoying. While the alien plot was great to get everybody together (and include Supergirl! ), I felt that it ended too easily. Sure, they destroyed the meta-bomb and caused the Dominators agony, but the Dominators retreated too easily. There was a whole lot more aliens than heroes, so it was wrapped up too nicely for my taste. Also, next time they do a super-ultra-mega-awesomesauce crossover, what are they going to do if they've already done aliens? Zombies? Civil War? Batman vs Superman? Overall, the crossover was fun and definitely worth the watch. It was exciting, had a lot of great moments, and satisfied my anticipation. When can we do this again? What did you think of "Invasion!"? What did you think of the entire crossover event?